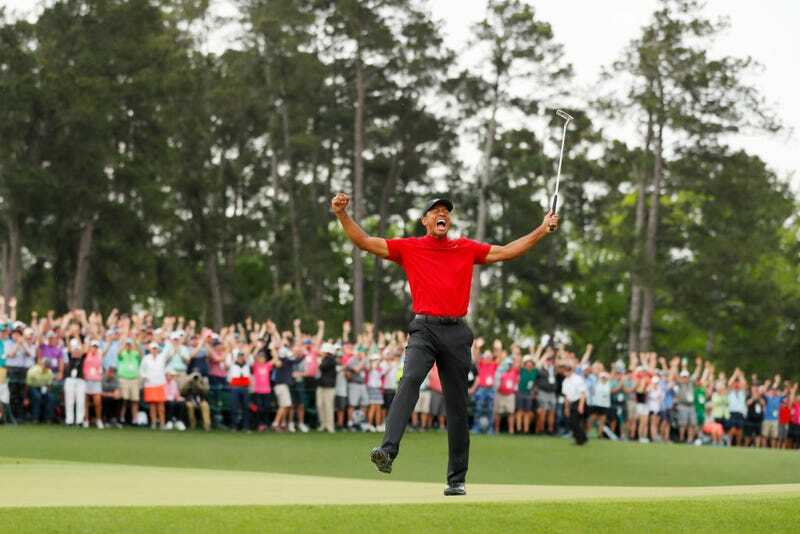 Tiger Woods made a triumphant return to Augusta National on Sunday, winning his fifth Master’s Tournament (and his first since 2005), becoming one of the oldest golfers to win a major tournament at age 43, and putting him three back from tying the record for most majors titles, currently held by golf-legend Jack Nicklaus. Only two years ago, Tiger wasn’t sure he’d ever get back to this point. And I’m pretty sure most of us never thought we’d see the Tiger Woods of old—the dominant, fist-pumping Tiger who loomed over the golf world with his first major win in 1997 (also at The Masters) until personal scandal hit in 2009 and injuries threatened in 2015. Honestly, I didn’t know how much I cared until I saw that he was one shot off the lead at the end of Saturday. And Saturday meant that I was going to be up early on Sunday preparing to watch Red Shirt Tiger Woods. During his dominant runs through golf (culminating with his holding the consecutive No. 1 golfer in the world spot longer than any other golfer in the history of the sport), Tiger’d always rock a red shirt on Sunday. Red-Shirt Tiger is like Mixtape Wheezy; dominance and blackout good. And then he won. Seeing him explode with emotion and hug his kids and be happy made me happy for him. Both as a person and for black excellence. Put a pin in that black excellence part. We’ll focus on the person first. Tiger said that he didn’t think he’d get back here again. I think anybody who follows golf felt the same way. Whereas other golfers used to basically fight for second place, he wasn’t mentioned in the same way anymore. Considering what he’s gone through, no matter how self-inflicting, a good redemption story is always welcome and I literally felt like Tiger was my actual problematic cousin while watching; I chided him for missing putts and I even wanted to wring his neck when he bogeyed the 18th hole. When he won, I texted my mother and father, who, along with Venus and Serena, have adopted Tiger as one of their own children, to congratulate them on all that black winning. It mattered. It mattered to them and controversially, to us. I know everybody will not agree. There are many people (for the record, I’m not one of them), who believe that a Tiger victory means nothing for black culture much less black excellence. Some feel that Tiger, through his own “Caublasian” creation, has bowed out of blackness in favor of a more inclusive approach to who he is. Now, I understand why this is an issue for many: Instead of opting into his blackness (one day we may call Rachel Dolezal revolutionary; I’m only half joking) he oped out of it. The thing is, there’s actually nothing wrong with this. Because of today’s climate, it feels like a much more political act than it can be. As a biracial person, I can understand wanting to include all parts of who you actually are. I own and proudly claim my blackness for personal, societal and political reasons, but that is because of how I was raised. I was raised in a black household; my race was never up for debate or question. I was always black as far as I can remember. On purpose. Other mixed folks aren’t raised that way. And it took me a long time to even accept letting people just be who they want to be. Plus, being “Caublasian” does actually include black in it, just with other stuff. In my head, the one-drop rule mattered. And it still does, but it’s not my job to police anybody’s blackness unless it’s detrimental to the black community. And if I’m being totally transparent here, I’ve had people tell me that I shouldn’t be claiming blackness since I’m not black black. For all of the claims that Tiger doesn’t “represent” blackness, there are lots of people who don’t want him doing it either. Being black isn’t as simple as saying it. Where Tiger understandably becomes a problem is his lack of leaning into blackness when it matters most. Politically, he might as well be a white man. He’s not outspoken, almost to the point of aloofness about black issues. You literally cannot land on one single moment where Tiger has stood in that blackness in an important, political way. Plus, he golfs with Donald Trump. If Trump is your homeboy, you are a problem. So I get why many in the black community want no parts of him. Sure he’s a great golfer—one of the best—but this isn’t a win for blackness. I come at it from a different angle. Just because you don’t lean all the way into blackness, doesn’t mean you lean out of it entirely. And frankly, I want his wins for the culture more than I need it to be Tiger getting them. To me, for the culture and for dominance in the long-held white man’s sport, I’m taking these wins for the community. He’s already got so many damn records in golf, I want the one that matters. I want the most majors. Tiger currently has 15; at 19, he’d own the most majors outright, and I’m not sure anybody is breaking that record. The closest people after Tiger are all old white men who ain’t playing. I’m sure it would fall one day (should Tiger actually get there), but for now, I want it. And Tiger can still get there. When the golf world talks about the most dominant, greatest golfer of all time, I want a black man named Eldrick to be at the top of that list and I don’t care if Tiger would “own” it as such. I don’t rock with Ben Carson right now, but I’m gon’ take those “gifted hands” for the culture whenever I can. He just can’t come to the cookout anymore, and I’m fairly certain he used to eat all of the mac and cheese. Tiger Woods has a complicated history with blackness. That’s fair and if you don’t love Tiger, I get it. If you can’t root for Tiger because you think he’s a sellout, I think that’s unfair but I wouldn’t argue about it. But for me, I’m both happy that Tiger got back to the top and that him getting back to the top puts a black man one step closer to owning a world that black folks were barred from until it was illegal to do so, and then a black man came through and crushed the buildings. I want that. Tiger, handle your business, bruh.